of eight choirs from five states. 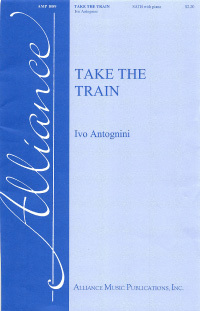 “Take The Train” is a standard carpe diem poem, inviting the listener to seize the day and go ahead and take one of the many trains that present themselves to us every day in the form of opportunities and inspirations. Too often we waste time in hesitation, regret, selling ourselves short, convincing ourselves that we could never do this or that. Itýs good to be reminded that life is a journey, not a destination. Sometimes we win, sometimes we lose. But if we never even take the train, well . . .